I have a very special post today. I am going to show and tell what are my very favorite tea things and accessories. We will start with tea sets. I have three tea sets that I absolutely love. I will include a fourth one, but sadly, the tea pot cracked, and though I glued it back together, I am very afraid of using it. Here is a picture of the said tea set before the teapot cracked. So the first one is the first tea set that I ever got, which is the Felicity tea set from American girl. I received this tea set as a birthday present when I turned thirteen. 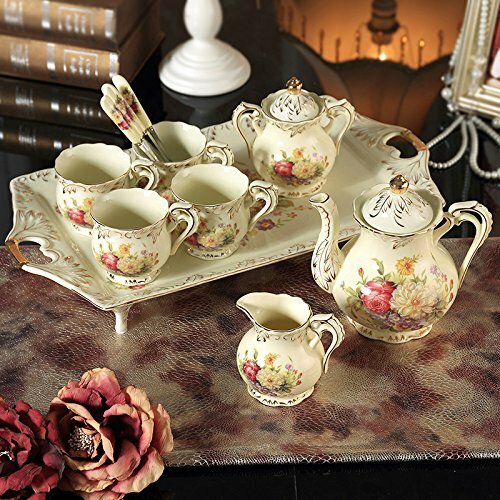 I love the colonial look to this tea set, and although it is small, the tea pot hold about four cups of tea. I usually get this tea set out when it is just me. as I don’t have to worry about it using too much space on my small desk. The next tea set is the one I got and blogged about a few years ago, my English tea set. It is a great tea set to have for company. When my sister and I are off together, this is the tea set we reach for, because it just holds a little more tea than the Felicity one. The second tea set is the last one I got. It is kind of a tea set and coffee set in one. I am always the one that likes to be super prepared when it comes to entertaining. If any of my guests like coffee, then I have a perfect coffee station for them. I haven’t used the coffee stand and mugs, as I am not a coffee person, but I have used the tea set a couple of times. Again, if it is just me, then I like to use something really small. Now we are done with tea sets, I am looking for even a smaller one, other than my felicity tea set so I can have a bit of variety, but now we are going to linens and tea utensils. The utensils I have are these little silver spoons, which are absolutely lovely. My mother got them for a tea party, but we never used them and she just gave them to my sister and I to keep. I also have a case of gorgeous silver, which I will use for company. I don’t have many tea linens yet. I have a couple of tea tatted dollies that I received from friends sweet sixteen birthday parties which I use to decorate the tea tray. I also have a little collection of handkerchiefs, but I don’t have any tea napkins of my own yet. I really enjoyed sharing some of my favorite tea things. And I hope I inspired some of you to relax and enjoy an hour of tea.